Paul Matosic works mainly with found or recycled objects – through this he expresses a healthy disdain for a society that is consumed by its desire to acquire ‘stuff’. Much of his work results in large scale floor based installations though he also works with moving image, often making films based upon his installation work. In March of this year, Paul Matosic was one of thirty artists based in Nottingham who had to vacate their studios because the owner of the building wished to regenerate the space as a centre for the creative industries. They had occupied these spaces for about twenty years but it would seems the owner did not necessarily regard art as creative. 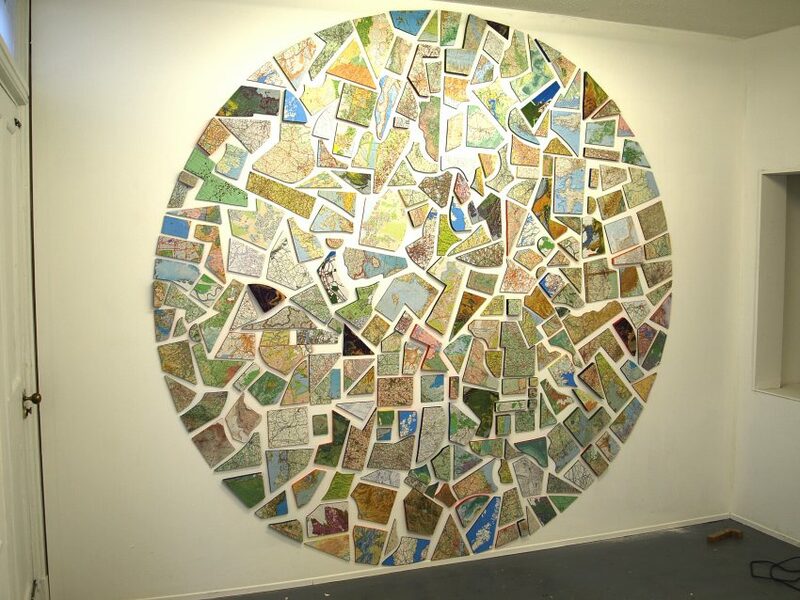 Prior to vacating his studio, Paul was starting a new piece of work based on a wide assortment of maps and an equally wide assortment of wood off-cuts. Sections of map were being glued to the blocks of wood to make up a large scale wall based installation. Bank Street Arts were delighted to offer Paul the opportunity to complete the work in one of our galleries over the Summer. The residency allowed Paul the space to make this work and to experiment with its installation, initially as a floor based piece and then elaborated as a wall based work. The residency gave Paul the opportunity to develop this work utilising the space as both a studio and display area.